A tradition of eye care excellence with over 75 years of combined experience. Our eye doctors use today’s most advanced technology and techniques including the latest medications, diagnostic testing, laser treatments, and surgical procedures recommended. As one of the region’s most established comprehensive eye care facilities, our list of services includes treatment for cataracts, glaucoma, and corneal, retinal and diabetic eye conditions. We also offer the most advanced laser vision correction procedures to correct nearsightedness, astigmatism, and farsightedness with a procedure called LASIK. The eye doctors at Bausch Eye Associates have actively built and encouraged a relationship of trust and expertise with your local Optometrist. We believe that patients receive the highest quality of care when doctors in different areas of expertise combine their skills. Enjoying life without depending on glasses or contact lenses may be closer than you think. Today vision correction options have dramatically expanded. Procedures are highly individualized —- no longer ‘one size fits all.’ These options, the current advanced technology available combined with the skills of a superior surgeon derive results better than ever before. Now you can truly choose a procedure to fit your lifestyle without compromising the visual result. Choosing the right surgeon can be overwhelming. How can you be sure? RELAX. We’ve taken the guesswork out. Dr. Andrew Bausch is the most experienced Refractive Cataract Surgeon in the Lehigh Valley area. With a Board Certified Surgeon, you have peace of mind because your precious eyes are in the most competent hands. Many surgeons tout experience and safety, but Dr. Bausch also focuses on quality of care. We know that electing to have vision correction surgery is one of the most important decisions to undertake. Personalized plans for LASIK in Allentown. 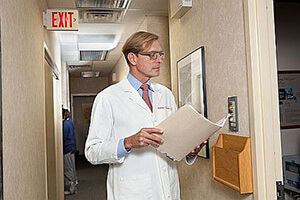 At Bausch Eye Associates, we carefully explain the options and advise you on how to achieve the best visual result. You’ll work with Dr. Andrew Bausch to devise a personalized plan with the goal of having you see more clearly than ever before. Dr. Bausch has a proven track record providing consistent, superior outcomes. His happy patients are also won over by his compassion, understanding, and kindness which has translated into extremely high patient satisfaction ratings. To determine which Laser Vision Correction procedure is right for you, our experienced technicians and doctors will evaluate you thoroughly. Dr. Bausch will discuss the findings and together with you, choose the option to achieve your best visual potential. You may be a candidate for more than one procedure such as LASIK, PRK, or possibly premium Lens Cataract Surgery. In each and every circumstance, an individualized care plan will be designed to specifically meet your visual needs and expectations.